'The politics of it may be wishy-washy and the saviour at Darkest Hour's centre may well be a racist, an imperialist, and an alcoholic, but in Gary Oldman's nimble skin, smacked in layers and layers of prosthetics to resemble the heavily-jowled, cigar-smoking, portly penguin-like demeanour of the British Bulldog, it pretty much screams, "And the Oscar goes to"...' notes Sukanya Verma. Led by Adolf Hitler, the Nazi invasion is in full steam and Western Europe is on the brink of collapse. The political scene in Britain could not have picked a worse time to be in shambles. Shortly after Prime Minister Neville Chamberlain is forced to step down, nothing short of a miracle is expected from the man to replace him. And a miracle is exactly what he delivers. Winston Churchill is accorded wholehearted reverence and solo credit for his leadership in effecting Operation Dynamo during World War II in Joe Wright's Darkest Hour. And the statesmen Chamberlain (Ronald Pickup), Earl of Halifax (Stephane Dillane) who disapprove of the newly appointed prime minister's belligerence are treated like villains of the piece. To be depicted this unflatteringly for sharing an opposed point of view especially when Hitler's the real devil, purely to eulogise Churchill's ballsy strategies, renders the narrative a deceit Darkest Hour never fully recovers from. Worse it concocts soppy, fictional instances of Churchill's connection to the hoi polloi when he takes the tube to convey a belated coming-of-age post his privileged 'I've never travelled by a bus, queued for bread' admissions. It's one thing to celebrate an icon and another to completely exempt him from scrutiny or objectivity. Yet Wright's propensity to humour Churchill's bullish behaviour as though he's not much different from a smart, snotty child craftily skirts the negativity surrounding his persona. 'His record is a litany of catastrophe,' grieves King George VI (Ben Mendelsohn) citing the Battle of Gallipoli, the Bengal Famine, the Russian civil war, and King Edward VIII's abdication confirming why he's least likely to top the favourite charts of most Indians. Fluke or farsightedness, his stance in the matter of Hitler excuses everything. The veteran chameleon is not new to the prosthetics game. His creepy transformation into the immortal Dracula sporting more hair, more wrinkles, in Francis Ford Coppola's showy adaptation of Bram Stoker's book is still the most enduring memory of the uneven masterpiece. Richard Burton, one of Churchill's most vocal critics who played him in a television movie called The Gathering Storm, found him to be no different from an actor with a wider audience. Oldman picks this element of theatrics and incorporates it cunningly to dispense playing-to-the-gallery speeches ('We shall fight on the beaches') livening up a predominantly indoor atmosphere. That is some contrast to the breathless fight for survival in Christopher Nolan's Dunkirk, which depicts the practical side of the same situation. 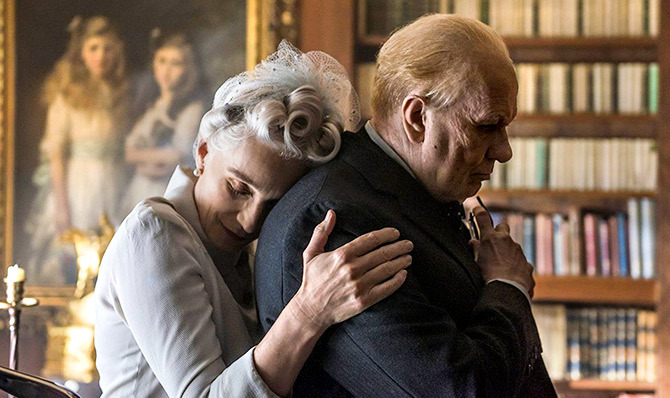 Portions of Wright's Atonement featured it too, but Darkest Hour limits its biopic-like portrait of the British Bulldog to a turbulent test of power, skills and quirks. If Oldman's relish in quipping zingers like 'Halifax would never turn it down. He's the fourth son of an Earl. Fourth sons turn nothing down' transcend through the makeup, so does the dilemma and desperation of running a nation not always as confident as his ferocious disposition would suggest. The women -- the wife (Kristin Scott Thomas), the secretary (Lily James) -- occasionally show up to soothe his ruffled feathers and throw in the obligatory pep talk. Darkest Hour doesn't even pretend to make it about anything else besides Oldman as he gloriously alternates between a exuberant bear, shrewd fox and vociferous lion. Though his animal instincts hit their peak, the script itself begins to lose its edge-of-the-seat momentum and disintegrates to revel in hollow glory and glib eloquence. Having said that, it's sure indicative of the brand of leadership we'd be surrounded by eight decades later.